Bouge Blog: Life is like...a box of chocolates?! et me clue you in to a little secret: Life should not be "like a box of chocolates" - Mr Gump got it all wrong. Do you want to eat something where "you'll never know what you're gonna get?" No. You want eat something where you don't care what you're going to get because it's guaranteed to be amazing. Enter the macaron, from Ladurée. Not to be confused with "macaroons", macarons are a small and delicate French pastry made of egg whites, sugar, and almonds. 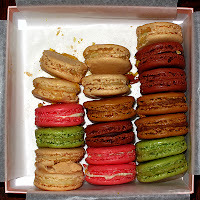 They come in a zillion colors and flavors and are an amazing treat alongside of your afternoon coffee. Texture of the lightest cupcake, with the slightest crunch of an exterior giving way to a smooth, cakey interior with sometimes bold, sometimes subtle flavors ranging from rose to pistachio. Although disputed, it's origin is predominantly thought to be French, circa late 1780s. Other accounts state that it originated from Italy in the 16th century. The basic recipe is heralded by renowned pastry chefs around the world for it's flexibility with coloring and flavoring. There's a great article on SeriousEats.com on the topic of macarons. Ladurée is perhaps the most famous of the macaron producers. Founded in 1861, they sell over 15,000 of the tasty treats per day. Most of those don't leave Paris, but the joy is beginning to spread. Unfortunately they have not come to the US, but I was able to dig them up in London at Covent Garden. Their site is totally fun and worth a visit. 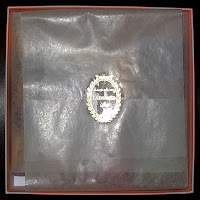 As though the pastry wasn't enough, the gift boxes are absolutely stunning and everything is packaged with immense care. A box made it home with me in my carry-on luggage quite successfully with little damage. 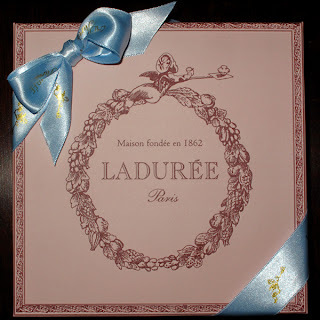 (Thanks both to Ladurée and Zero Halliburton) Keep refrigerated and they'll hold for about a week. If you do port them back from wherever you are, though, be sure to sample at least one in the store. Savor it, and keep that needless decadence in your mind as a baseline of the perfect treat. Box of chocolates? Pah. 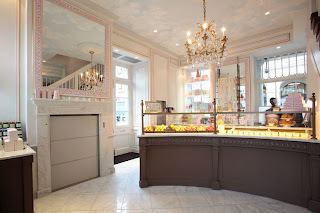 December 15, 2011 Update: Ladurée is now in New York!